Canadian champion Conquest Enforcer was euthanized on Dec. 26 due to complications from a bladder stone, owner John Guarnere announced on Twitter. The 5-year-old Into Mischief horse was in Ocala, Fla., for a freshening with sights on a January return to the races when a stone was found to be disturbing his urine flow. A hole was discovered in Conquest Enforcer's bladder, which would have prevented him from living comfortably, and the decision was made to euthanize him. 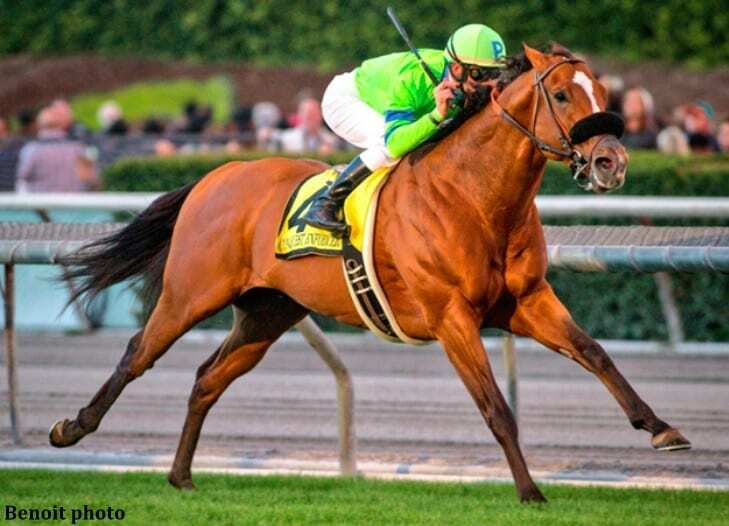 Conquest Enforcer died exactly two years after his highest-level victory, when he took the Grade 2 Mathis Brothers Mile Stakes on opening day of Santa Anita Park's 2016/2017 meet. Conquest Enforcer won five of 17 starts during his on-track career for earnings of $551,938. Bred in Ontario by Tall Oaks Farm, Conquest Enforcer was initially campaigned by Conquest Stables and trained by Mark Casse. He debuted with a fourth-place effort in the G2 Summer Stakes at Woodbine, then returned a month later to win the listed Cup and Saucer Stakes at the same track to round out his juvenile campaign. Conquest Enforcer secured Canada's champion turf male honors during his 3-year-old season, on the strength of victories in the listed Queenston Stakes and Charlie Barley Stakes at Woodbine, the Allied Forces Stakes at Belmont Park, and the Mathis Brothers Mile at Santa Anita. It was a somewhat unorthodox campaign, with its two major chapters divided when Conquest Stables owners Ernie Semersky and Dory Newell's announced they'd be leaving the sport. Conquest Enforcer was part of the stable's massive dispersal at the 2016 Keeneland November Breeding Stock Sale, and he brought the highest price for a colt when bloodstock agent Zach Madden secured him for $785,000 on behalf of Loooch Racing, Inc., later adding Guarnere's Imaginary Racing and Raquel Ritchie to the partnership. Moved to the Southern California barn of Philip D'Amato, his first start under new ownership was his Mathis Brothers score. Guarnere and Ritchie eventually bought out their partner near the end of 2017 and moved Conquest Enforcer back to Casse. Glenn Ellis replaced Ritchie in the partnership in early 2018, and the horse was moved to trainer Jorge Navarro for his final start, in the G3 Red Bank Stakes on Sept. 1 at Monmouth Park. This entry was posted in Racing and tagged conquest enforcer, conquest stables, Glenn Ellis, Imaginary Stables, Loooch Racing, Mark Casse, obituary, philip d'amato, Raquel Ritchie by Paulick Report Staff. Bookmark the permalink.